All plastic filter housings are offered in different materials and styles to meet the demanding needs of both your fluid process, as well as you budget. PurFlo filter housings are single housings constructed of bronze, cast iron, and 304 or 316L stainless steel. Operating pressures to 250 psig accommodate a larger range of applications than plastic filter housings. DuraFlo™ HP Series Filters are specifically designed with industrial water and glycol applications in mind. Constructed of a cast iron head and seamless carbon steel sump, they are highly an economical solution to many high pressure applications. 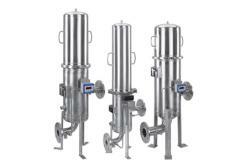 High-performance filters for modern process systems. Cartridge filter housing.